My name is Kari Anne and I'm a breeder of Jack Russell Terriers. I live in Bardu which is located in Troms in Norway. Here I live on a farm after my grandparents together with my husband André, and our two kids Maren and Ole. 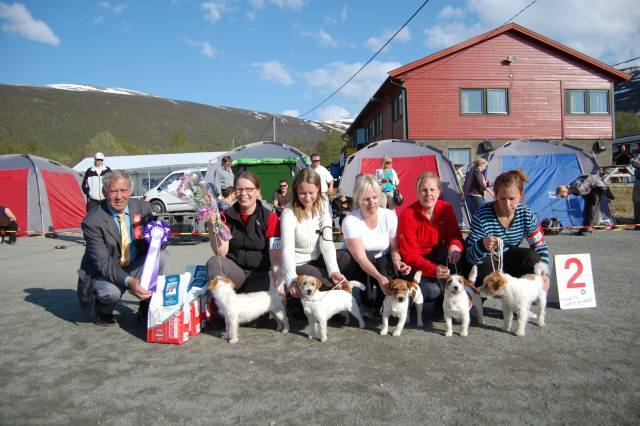 We are members of the Norwegian Kennel Club (NKK) and the Norwegian Terrier Club (NTK), and our goal is to breed JRT according to the Federation Cynologique Internationale (F.C.I.) standard with good health, and good temperament. Like many other Jack Russell breeders I discovered the breed through the “stable version” we often see in stables, and fell in love with this wonderful breed. I got my first Jack Russell in 2005, and from that moment on I have never had a boring day. At the moment I have 6 dogs at home. The dogs are trained hunting for mink, vole and mice. We hope you will have a great time while surfing around our website.